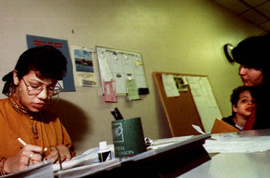 A woman applies for unemployment after companies in her community moved jobs to Mexico. An unemployed person is someone who does not have a job but is looking for one. The unemployment rate is the percentage of unemployed persons compared to the total number in the workforce. When the economy is good and people are buying lots of consumer goods, companies hire more workers and the unemployment rate drops. Conversely, when there is a downturn in the economy, companies lay off workers and the unemployment rate rises. Since the 1950s, the unemployment rate in the United States has fluctuated. The lowest rate for this period was 2.9 percent in 1953, while the highest was at 9.6 percent in 1983. In the late 1970s and early 1980s, unemployment rates in the “rust belt”— those Midwestern and mid-Atlantic states that were industrial centers and home to the auto and steel industries—went up as the market for heavy manufacturing took a downward turn. For many companies, it was cheaper to build new plants in other parts of the United States, or even in foreign countries, than to update the older facilities. In the 1990s, the rust belt began an economic turnaround. States diversified their economies, the national economy improved, and the switch from a goods-based economy to a service-based economy continued.